The recall formation the day before day 11 was quick. The Black Hats inspected our helmets. They wanted to make sure they’re in good working condition. Day 11: first day of actual jumps. I texted my pastor this past weekend that training was now done. The jumps we were about to do were for reals. 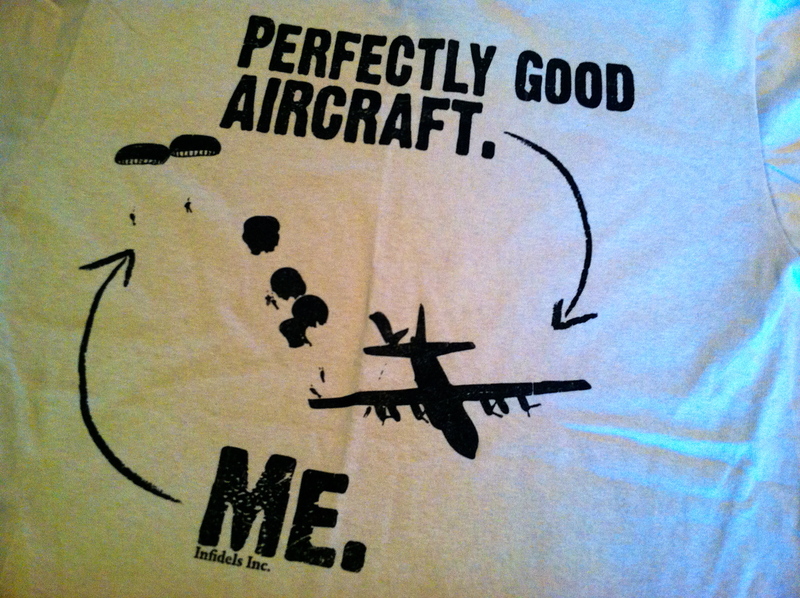 C-130. Over 125 knots. 1250 feet high. Leap of faith! My pastor replied “God’s grace is sufficient.” I agreed. At 0400 hrs, we were already on the cables for accountability check. We then double timed to the airfield, which is only about a mile from the company staging area. The pre-jump session consisted of reviews of malfunctions class, emergency landing techniques, parachute landing falls and mock door exits. Special attention was placed on static line control, activation of chute inside the plane, jump refusals, and airplane emergency landing procedures. Then came the harness shed. Misery spells the harness shed. The sun had not risen yet. We picked up our chutes. T-10 delta and reserve. Double timed. Rigged up. This was where the misery started. Torture on the shoulders. Shock on the groin. “Toe to toe, heel to heel. Feet and knees together. Don’t fall asleep.” The Black Hats drilled this into us. Twelve hours. Yes, that’s right, twelve hours of sitting in chalk order, JMPI’d (Jump Master Personal Inspection), and front-rear inspected! The wind would not calm down to under 13 mph. We had to wait. I have to admit, however, that the jump masters took their jobs seriously. Every inch of our equipment was meticulously inspected. Riggers were summoned and consulted with from time to time. But did I mention twelve hours! So finally, around 1700 hrs, we loaded up the plane. Look up, below! I’m coming through! We circled the drop zone again. “This is horrible!” I quietly complained. No one was going to hear me anyway, not in that noise, no. But I knew God did, so I prayed. “Lord, please let the wind die down so we can finally jump out!” Then the wind obeyed. That was a long one minute. That was the longest 30 seconds of my life! The jumpers, on the left door of the aircraft, thirteen of them all before me, one by one disappeared into the horizon. I saw everything. Then it was my turn. I was the last jumper on the left door. No one was going out of the right door. Right, because it would not open completely. (We’re in sequestration, it’s gonna be a while ’til that’s fixed!) So, my turn! I was the last jumper! Eye to eye with the Jump Master. Handed my static line to him. Sharply turned to the door. Eyes on the horizon. Stepped towards the door. Kicked up with the other leg. Whoosh! Head tucked in to chest. Arms tight to the side. Hands on the sides of my reserve. I was out of the plane. In a split second I had a meeting with a big wave of air that threw me completely perpendicular in relation to where I directed my body to go. I’m trying to describe being thrown out of a steel tube flying at the speed of 149.601 miles per hour. The only nagging insane fact is: I was actually doing it on purpose! 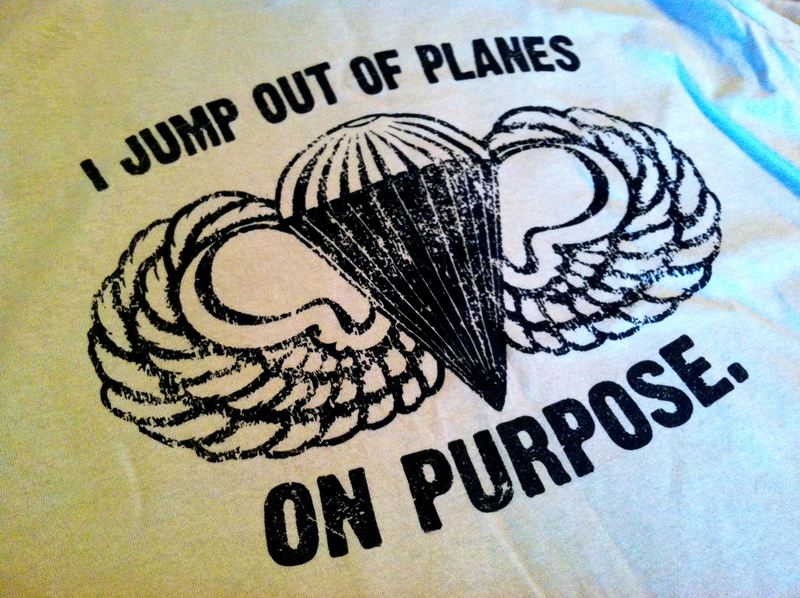 T-shirt I bought from “Ranger Joes” the day after my 5th jump.